For foam insulation installation in Knoxville, TN, there is only one name that homeowners trust, and that’s 31-W Insulation. That’s because they know that we have been the insulation experts that countless customers have turned to since 1972. We have the experience to take care of all your insulation needs because our home improvement professionals are experienced and certified in insulation installation. Closed-cell—One of the most efficient insulation products available with R-values around 6.5 per inch. This insulation uses gas within its cells, providing an exceptional insulating air and moisture barrier. Tests have shown that closed-cell foam also increases structural rigidity to existing buildings by as much as 30 percent, adding strength to any construction surface to which it is applied. Open-cell—Offers an air barrier that helps consumers reduce outside noise from entering their homes. It will absorb and release moisture vapor which means that it performs like wood, but it is an inert substance and not subject to the growth of mold, mildew, or bacteria. Open-cell insulation has an R-value of about 3.6 per inch and is a water-blown foam that does not use a hydrofluorocarbon (HFC) blowing agent. Green-foam—Addressing environmental concerns, our green insulation is based on renewable products, such as soy and recycled plastic materials. Green-foam has an R-value of 6.9 that does not diminish over time. Whether Knoxville homeowners choose open-cell, closed-cell, or green, foam insulation has numerous benefits, including savings in energy consumption, because closing tiny gaps prevents conditioned air from leaking out. Homeowners will also enjoy a more comfortable indoor environment due to reduced outdoor allergens entering the building, and a quieter home environment because the insulating barrier reduces ambient outside noise. 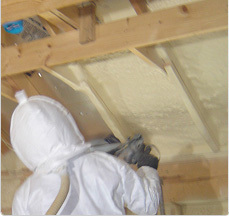 For more information about foam insulation installed for Knoxville, Tennessee, homeowners, contact the home improvement experts at 31-W Insulation today.